Readers, some of you have been asking me to post recipes, and I’ve got a treat for you today! 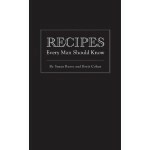 Susan Russo, co-author with Brett Cohen of Recipes Every Man Should Know, has generously agreed to let me share some of the delicious goodies packed into their little black book (see the cover, below). You can purchase a copy at bookstores, or online from Amazon or Barnes and Noble. If the book is sold out, just ask. Your bookseller should be able to order it for you. You can also find more of Susan’s recipes at her blog, Foodblogga (and believe me, once you’ve tried these, you’ll want more). I confess that I seldom post recipes simply because I’m not much of a cook–but my husband is, which makes Susan’s book even better. I just gave a copy to him for an early Father’s Day gift–sneaky, yes? He gets to cook, and I get to eat. 2. Combine remaining ingredients in a blender or food processor and pulse until chunky (or you can use a fork to mix). This dish takes about 15 minutes to prepare and yields 6-8 servings. 1. Warm oil in a large pot over medium-high heat. Add onions and peppers and sauté 5 minutes. Add meat. Cook until browned, about 10 minutes. Stir in spices, salt and brown sugar. Add beans, tomatoes, and beer. Stir and bring to a boil. Reduce heat to low and simmer 20 to 25 minutes, or until thick and soupy. Stir in cornmeal in you want a thicker chili. 2. Serve chili hot, topped with any of the following: shredded Cheddar cheese, sour cream, diced avocado, sliced scallions, or fresh cilantro. This dish takes 30 to 45 minutes from start to finish and serves 6 to 8. A huge THANKS to Susan Russo, who allowed me to reproduce these recipes and photos, and to my friend Lucy Mercer, for directing me to Susan in the first place. Don’t miss Lucy’s blog, A Cook and Her Books, which is delicious and delightful and always fun to read. Ladies, you are both awesome! I can speak for both recipes – delish! 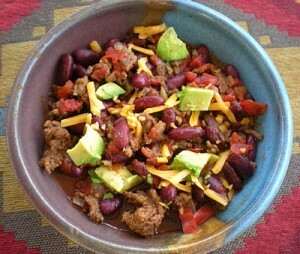 We love chili on cool, fall evenings. 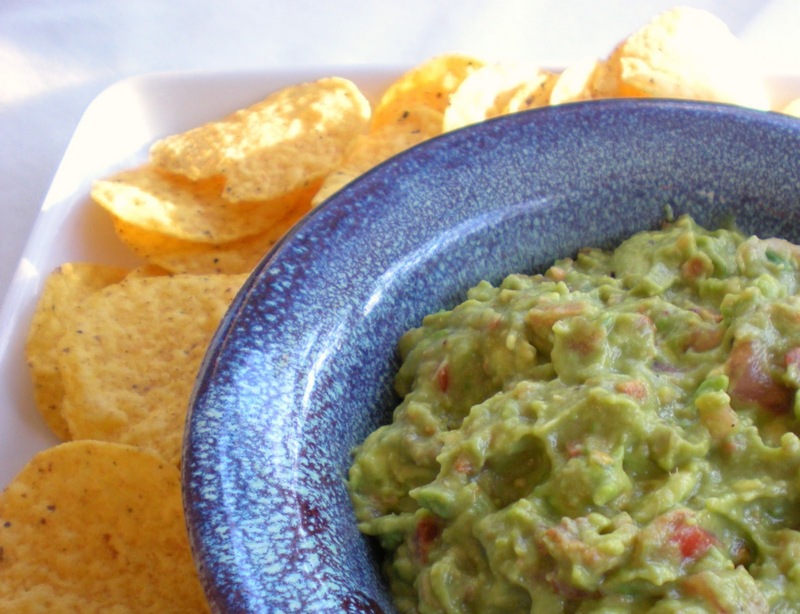 We love guacamole, like this recipe, year-round!